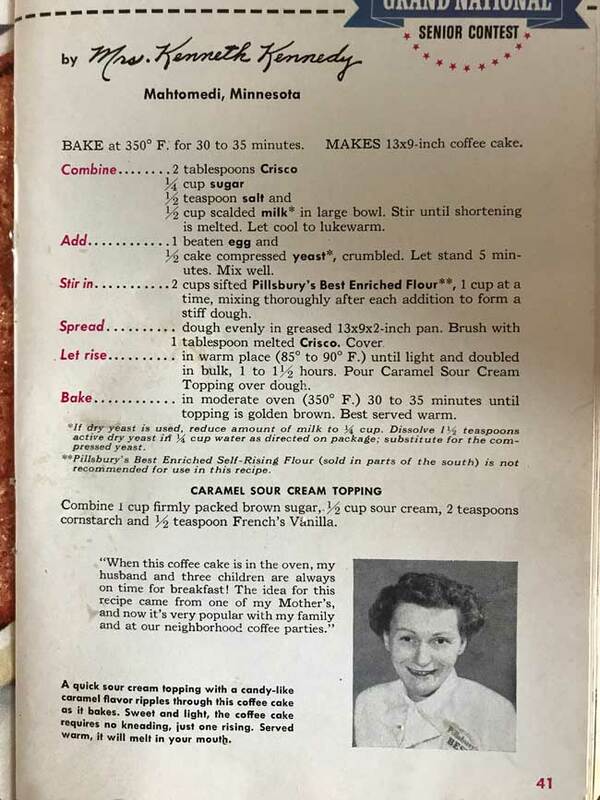 It’s been a while since I posted an old Bake-Off recipe, so here’s a “new” one from Pillsbury’s 6th Grand National $100,000 Recipe and Baking Contest held in 1955. The recipe is Swedish Ripple Coffee Cake and it was created by Mrs. Kenneth Kennedy who won third place and took home $2,500. In case you were wondering, the second place and first place winners were Caramel Chewy Cake ($7,500) and Open Sesame Pie ($25,000), which is often credited for the rise in the popularity of sesame seeds. 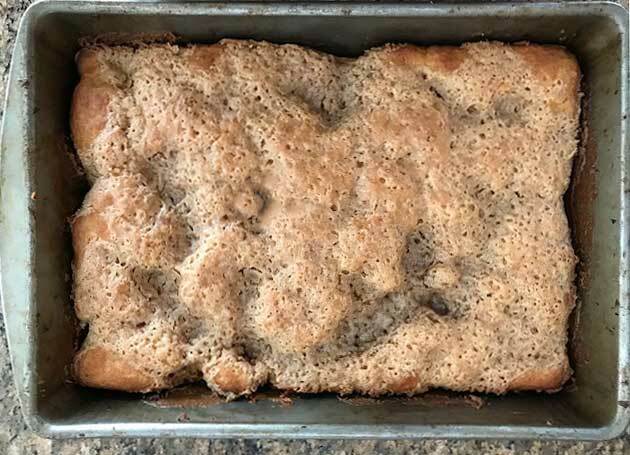 Given the history of Open Sesame Pie along with the popularity of some other recipes from that year, it’s possible that Swedish Ripple Coffee Cake was overshadowed by its more illustrious competitors. Even though it took home a prize, it’s a very humble affair. 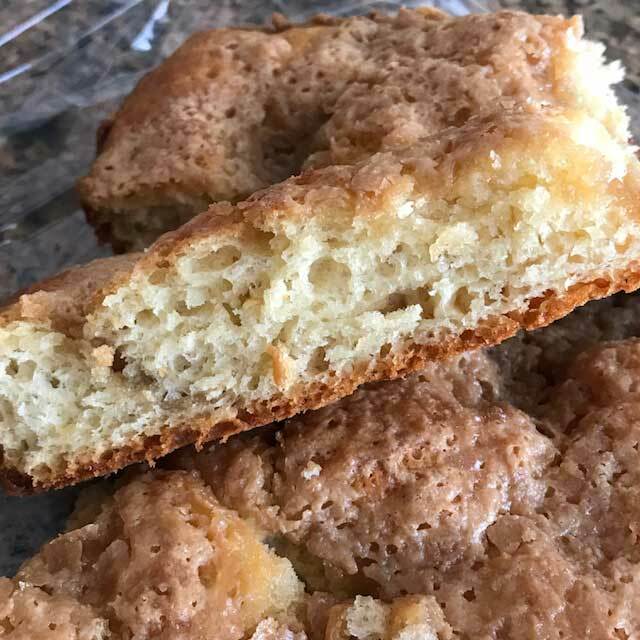 It’s a yeast-risen coffee cake topped with a mixture of brown sugar, sour cream, cornstarch and vanilla. You stir ingredients together to form a soft dough (no kneading required), press it into a pan, then pour over the brown sugar topping. When baked, the topping caramelizes and forms ripples, and you get something like a sticky bun in cake form. Swedish Ripple Cake is not exactly pretty, so I recommend making it in one of your nicer baking pans. I didn’t bother since I was just serving this to the family, but I wish I had. 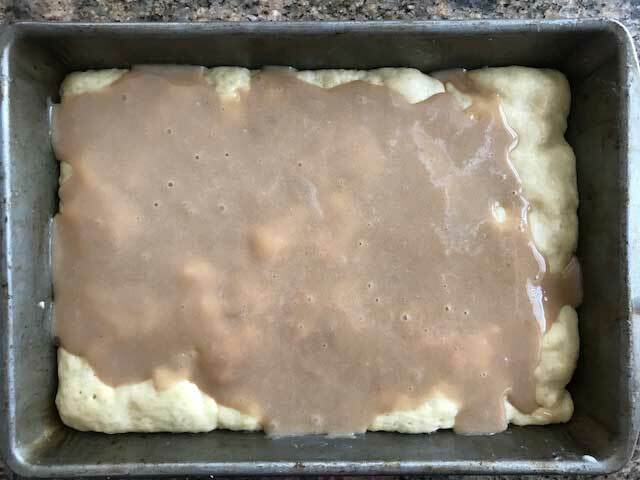 After making the 9×13 inch version I wanted to see what would happen if I made a half batch coffee cake using an 8 inch square pan. I also wanted to see how fast rising instant yeast (Platinum) would work, as opposed to the active dry. It rose a little, but it seemed like the version made with fast rising yeast didn’t rise as much. This was a surprise since instant yeast (Platinum) usually works just fine if not better. Whatever type of yeast you use, it’s still a fairly shallow cake so you get a good proportion of topping to cake. 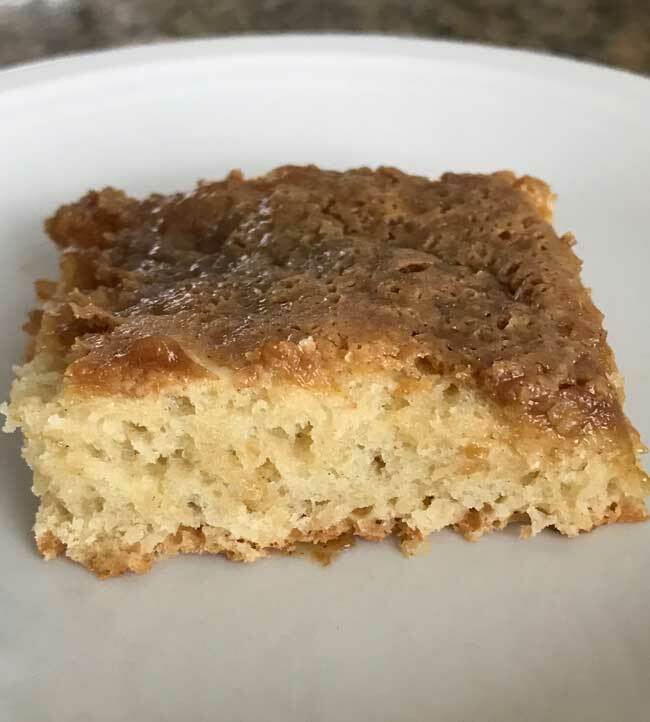 I recommend trying this if you like simple coffee cakes or are looking for something you can assemble a few hours ahead of time and then bake for breakfast or brunch. It’s plain, but also very tasty and open to some improvisation. 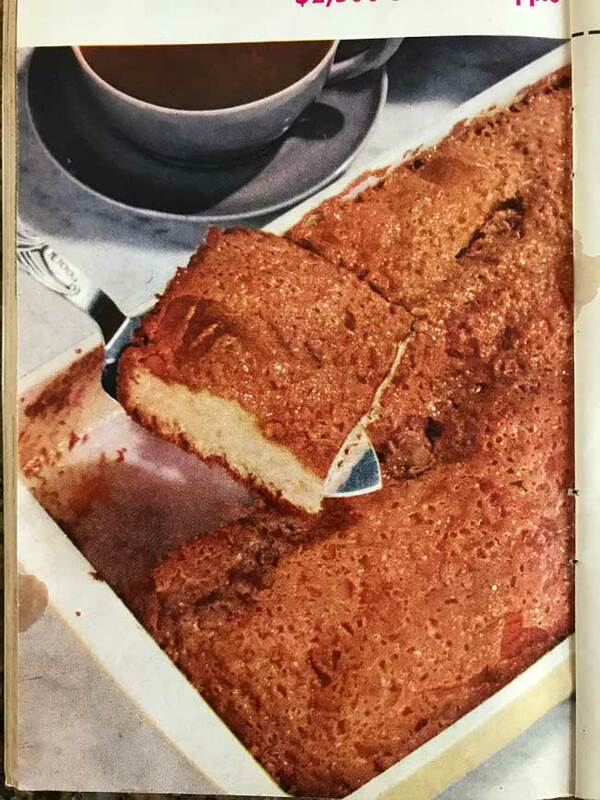 Swedish Ripple Coffee Cake is an old Pillsbury Bake-Off recipe from 1955. Grease a 9x13 inch baking pan. Stir the yeast and warm water together in a small cup and set aside to proof. Meanwhile, in a large mixing bowl, combine the shortening, sugar and salt and stir until blended. Add the egg and stir until blended, then add the water/yeast mixture. Stir until blended, then stir in the milk. Gradually add the flour, stirring to form a dough. It will be slightly sticky but firm. Press this dough into the pan (dampen your fingers and press), then brush top with a tablespoon of melted butter. Let rise for about 1 1/2 hours. Combine the brown sugar, sour cream, cornstarch and vanilla (and cinnamon, if using) and carefully pour over the top, spreading lightly. You can also make this with fast acting yeast. If using fast active yeast, omit the water and use 1/2 cup milk total. Mix the fast acting yeast in with the flour. If you don't want to use shortening you can use 1 tablespoon of butter and 1 tablespoon of oil. The texture might be a bit heavier. I think there is a point where the sugar can be too much and it competes with the yeast. The ratio of sugar to flour in this recipe is right on the edge of that and might explain why active dry worked slightly better than the instant yeast. I’m being a baking nerd. Lol!! Sue, usually sugar helps yeast so I’m not really sure. It still rose with the instant yeast and I’d make it again with instant yeast, but it was a little lighter with the active dry. I wonder if the amount of sugar in the dough affected the rise with the fast acting yeast? I think this sounds tasty and interesting!